Το Dwijaya House of Pakubuwono, στην περιοχή Πόντοκ Ίντα σε Τζακάρτα, αποτελεί δημοφιλή επιλογή για τους ταξιδιώτες. Από εδώ, οι επισκέπτες μπορούν να έχουν άμεση πρόσβαση σε όλα όσα η πόλη έχει να προσφέρει. Με την βολική του τοποθεσία, το ξενοδοχείο προσφέρει εύκολη πρόσβαση στους προορισμούς της πόλης που πρέπει οπωσδήποτε να δείτε. Το Dwijaya House of Pakubuwono προσφέρει επίσης πολλές εγκαταστάσεις για να εμπλουτίσετε την διαμονή σας στη Τζακάρτα. Κατά την διαμονή σας σε αυτό το υπέροχο ξενοδοχείο, μπορείτε να απολαύσετε τα 24ωρη υπηρεσία δωματίου, δωρεάν WiFi σε όλα τα δωμάτια, 24ωρη φύλαξη, ημερήσιος καθαρισμός, παράδοση ειδών παντοπωλείου. Όλα τα καταλύματα διαθέτουν τις απαραίτητες ανέσεις για να εξασφαλιστεί μια ασυναγώνιστη αίσθηση απόλαυσης. Το ξενοδοχείο προσφέρει μια άριστη ποικιλία ψυχαγωγικών εγκαταστάσεων, όπως τα βελάκια, αίθουσα γιόγκα, γυμναστήριο, σάουνα, γήπεδο γκολφ (σε απόσταση 3χλμ.). Με την ιδανική του τοποθεσία και τις καταπληκτικές του υπηρεσίες, το Dwijaya House of Pakubuwono θα σας ευχαριστήσει σε πολλά πράγματα. This place is near Malls however you would have to walk for about 10mins or take a cab. It’s very quiet and safe neighbourhood. The staffs are extremely friendly and polite. It’s very clean and spacious as well. It's truely a good stay this time at Jakarta, though it's a short trip. The kids and us enjoyed so much, in the room as well as the activities - the swimming pool and the sauna. We had a one room suite, it was clean and comfortable, it equipped with what we need in the hotel room. Not too difficult to get a grab car to Pondok Indah mall, 3 minutes away. At first when I saw it from outside. It looked ordinary but when entered the room. I think it was marvelous. My child is happy. She even wanted to extend to stay here. I will go there again for sure. Thank you house of pakubuwono. Keep up the good work. 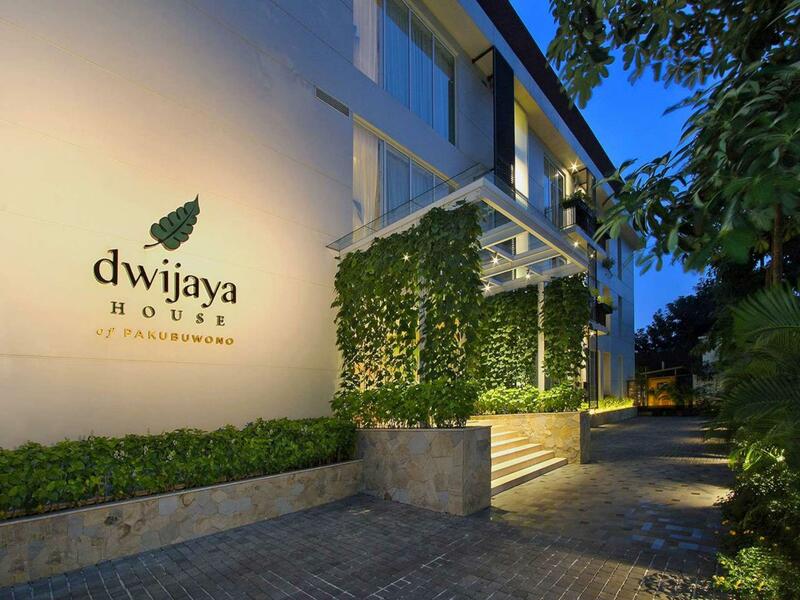 I stayed at Dwijaya House of Pakubuwono recently with my girlfriend. I'm very happy with the quality of my stay - the internet was fast and stable enough for me, the room was modern and clean, the shower was hot, the AC was working, the staff was attentive, the neighbourhood is quiet and the location is just 10 minutes walk away from the facilities at Pondok Indah mall. The only minor thing I noticed is that the ventilation system in de central area where the indoor pool is located is very noisy during the day. I didn't use the gym or the swimming pool. Its located in an almost secluded part of South Jakarta but its extremely serene without any noises from the main road. The room was spanking clean. The security and staff were extremely friendly and helpful. Thanks so much for the hospitality. 1. Very nice staffs, always friendly and helpful 2. Good facilities and good security 3. Location is quiet and private, however, not easy for transportation. At first we were surprised to find this hotel in some tucked away suburb/alley, but the property itself was definitely WAY MORE than what I was paying for. It was small and quiet, especially for smack dab in the middle of South Jakarta, and most importantly the place looked exactly like the photos, which was a huge relief. They gave us a room on the top floor in front of the zen garden and we also had a balcony which was definitely an added bonus. It's a bit hot in the pool area but i do like how it made the pool feel heated. The staff were welcoming and genuine which was a nice touch. But, the biggest surprise was the breakfast. I highly recommend the nasi goreng. They told us they get a lot of Japanese guests, now we know why. Compared to what we have been used to in Jakarta, this place is so clean! There were literally no mosquitoes! NONE! IN JAKARTA! This is a place that gives 5-star treatment for 3-star price. Definitely coming back soon. If you are someone who are looking for a quiet place with heartwarming service then I would greatly recommend this place. During my short visit, the staff are friendly and able to connect with people at the finest detail such as remembering my name instead of the typical 'sir'. To me, it is an intangible value that you will not get in typical hotel. The location is good with malls located not far from you as well as the environment is very peaceful and allows me to relax at the swimming pool. Overall, I had a great experience staying at Dwijaya House and will definitely stay there for my next trip. It was a pleasant surprise to discover Dwijaya. It's location is convenient, near to Pondok Indah Mall and Gandaria City. But, it is located in a secluded and quiet area of Radio Dalam. The staff gave a very warm welcome, and the apartment is really nicely decorated, maintained, with enough amenities for the stay. There is a gym and swimming pool, plus a sky garden that one can enjoy a quiet time at the top floor. Am recommending friends and families to stay here! I stay in the two rooms apartment, Overjoy with the room, it's clean, the kitchen stuff and cuttleries are full, very quite, suitable if you looking for a peaceful place in the crowd. They don't have in house resto though, so you have to prepare your own food there, but the Staff very nice, we can ask them to buy us the food.